A view of the main Supermarine hangar at Stewart Airport with its temporary banner. Rifton Aviation Services, the largest FBO at Stewart Airport in Newburgh, N.Y., 50 miles north of New York City, has been sold to American Airports Corporation, a California firm that operates Supermarine, an FBO at Santa Monica. The acquisition gives AAC a presence on both the East and the West coasts. The operation will be renamed to Supermarine of Stewart. The Stewart facility was purchased from the Bruderhof, an Anabaptist sect that founded Rifton and decided to get out of the aviation business. Rifton was originally established by the Bruderhof at Teterboro Airport in New Jersey in 1992, but moved to Stewart in 1997. In 2000, they opened a $10 million corporate aviation hangar at Stewart. The operation has two large hangars. One has four bays, each large enough to hold a Boeing Business Jet or Airbus 319, plus several other aircraft, according to John Meehan, manager of sales and development for Supermarine’s Stewart facility. There is also a second two-bay hangar. “We have one BBJ based here, in addition to 15 other jets and we have some hangar and office space available,” said Meehan. The operation has 120,000 square feet of hangar space. Supermarine offers fuel, hangar, office space and light maintenance. 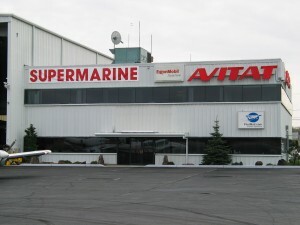 Five regional carriers operate at Stewart and are serviced by Supermarine. They are Independence Air, an independent carrier; American Eagle, an American Airlines service; Piedmont (U.S. Air); Pinnacle (Northwest Airlines); and Pan Am, another independent, which initiated service at the end of June. Supermarine also services the cargo aircraft of Federal Express, which operates 727s at the airport; United Parcel, which uses DC-8s and 757s; and Airborne, operating DC-9s there. The FBO has 32 employees at Stewart, all of whom were formerly with Rifton. A second FBO that operated at Stewart shut down early in May, according to Meehan. Stewart Airport has two runways, one 11,800 feet long and the other 6,000. The field has a category II ILS. Supermarine also manages the five Los Angeles County Airports: Brackett Field Airport in LaVerne, Compton/Woodley Airport, El Monte Airport, General William J. Fox Airfield in Lancaster, and Whiteman Airport in Pacoima. Additionally, they operate Henderson Field Airport on the Midway Atoll in the North-Central Pacific. For more information about American Airports Corporation, visit [http://www.americanairports.net].